Fairway rolling, which has been a relatively minor golf course maintenance practice for decades, has been upgraded for the 21st Century. New rollers, and new reasons to use them backed by research, mean more superintendents are rolling fairways. And before long, you may be rolling, too. It’s said that sooner or later, everything old is new again. Whether you believe that or not (it’s also said that 50 is the new 40), it just may be true for the practice of rolling golf course fairways. What had been an off again/on again cultural tool of the 20th Century appears to be a trend on golf courses of the 21st Century. In the olden days (when 50 was still just 50), rollers had a place on fairways during construction, or maybe in the spring after a course had experienced winter frost heaving and needed to be smoothed out before the season’s first mowing. But the benefits of modern fairway rolling are starting to stack up. They include dollar spot suppression, less cutting time and the accompanying mower-wear reduction, and reduced fungicide applications. Sal Rizzo, founder of Cheshire, Conn.-based Salsco, which since 2012 has marketed the stand-alone Tranz-Former fairway roller (so named because it folds up – transforms – to go over narrow bridges to the next fairway), says the idea was brought to him by a superintendent. 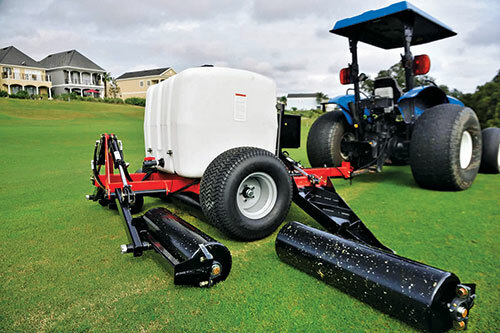 Offering another take on fairway rolling equipment — towed rollers — is Wayne, Pa.-based Smithco, which also exhibited in San Diego. The company’s new five-gang Ultra 15 roller rolls a 15-foot swath, and at 10 miles per hour will roll 18 acres per hour, which Smithco President Don Smith says is three times faster than mowing. The company’s year-old, three-gang unit, the Ultra 10, has a 10-foot swath and completes 12 acres at a 10-mile-per-hour pace. Smith’s faith in that market is solid, and he notes that he has seen three or four other models at recent shows. 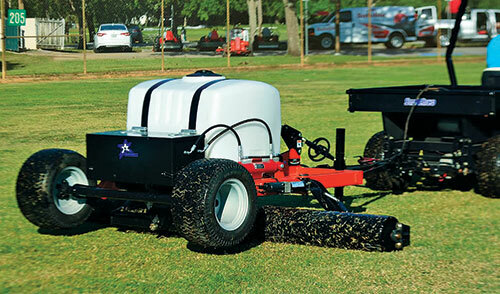 Tow-behind fairway rollers feature water tanks that allow superintendents to adjust the psi applied to turf. An important aspect of golf course maintenance missing from fairway rolling in the days of yore is coming to the foreground in the new century: research. Among the first turfgrass scientists looking into the practice are Geunhwa Jung, Ph.D., along with research assistant Jay Popko, at the University of Massachusetts-Amherst’s Stockbridge School of Agriculture. Preliminary results of their field studies are promising for superintendents currently rolling fairways and for those thinking about it. 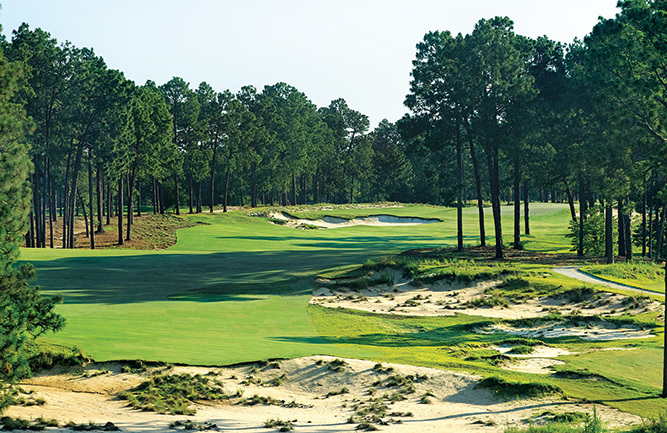 Jung says the practice has the potential of becoming a “game-changer” in the turfgrass industry because of “potential” physical changes in plants, thatches and soils and the microbial composition associated with them. These changes, he notes, may justify reevaluation of currently used cultural practices and chemicals. Jung and Popko also observed differences in the soil profile, and rolled treatments did not have a distinct thatch layer like the non-rolled treatment. “We observed that the thatch layer has been pushed into the soil,” says Popko, “and further tests are being completed to quantify the organic matter in the top of the soil profile.” Moreover, soil penetrometer tests “confirmed that rolled plots have higher resistance to penetration.” The soil profile alterations may lead to increased breakdown of the thatch layer or explain anecdotal reports from superintendents of increased driving distance on rolled fairways. In addition, the researchers say, future studies will examine ball roll in an attempt to quantify these observations. At Michigan State University, Thomas Nikolai, Ph.D., has been looking at the effects of rolling greens since the 1990s, and he, along with graduate assistant Thomas Greene, have about three years of fairway rolling research under their belts. However, those studies were hampered by not actually having a fairway roller and having to use a greens roller instead. 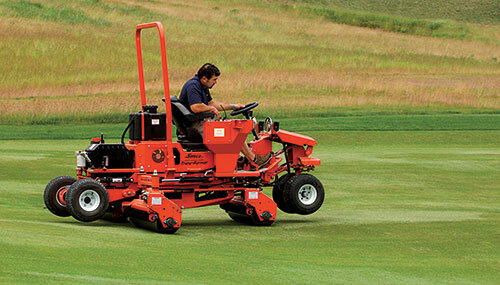 Nikolai is now looking at three courses that are using Smithco rollers on fairways. According to Salsco founder Sal Rizzo, the benefits of rolling fairways, including reducing dollar spot, are well understood. “If you have the time and have the machine, I would stop applying pesticides,” he suggests to superintendents. 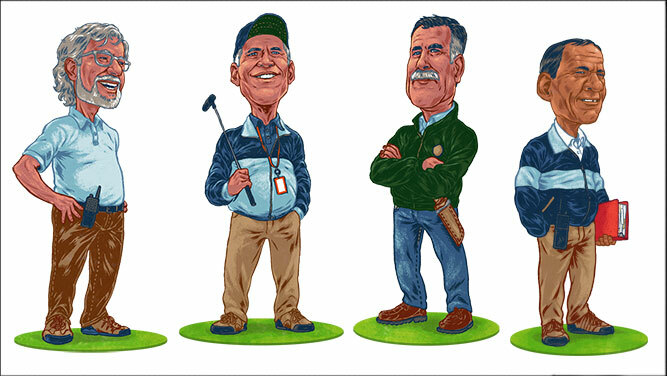 “I would pick two par 3s and roll half the fairway and not roll the other half. Do a little experiment. If you’re not getting results and you have something that you can add water to and increase the psi, I would put more water in the drum. Try to find the (correct) psi yourself. 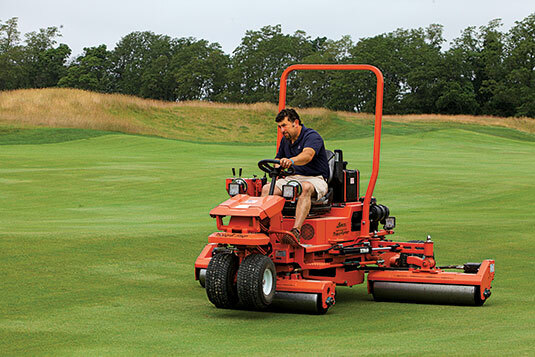 On the superintendent side, one convert to fairway rolling is Tim O’Neill, CGCS at the Country Club of Darien (Conn.), and a former president of the GCSAA. O’Neill was an early adapter of Salsco’s Tranz-Former, which he’s had for about three years. According to Michigan State’s Thomas Nikolai, more research is needed to determine optimal weight for fairway rollers. “We don’t want the roller to weigh too much,” he says. And what about the question of the more expensive stand-alones versus the less-expensive tow-behinds? “I’m all for the whole notion of rolling,” O’Neill says, “and if you can get it done with those tow-behinds, OK. Whatever fits your budget, if you’re not so worried about tire marks. I like the ability to not have to tow this thing so that there are no wheel marks from a tractor or a heavy-duty utility cart.